Is it summer yet? I’m not sure how much more of cold and flu season I can handle. The new year started off well enough. 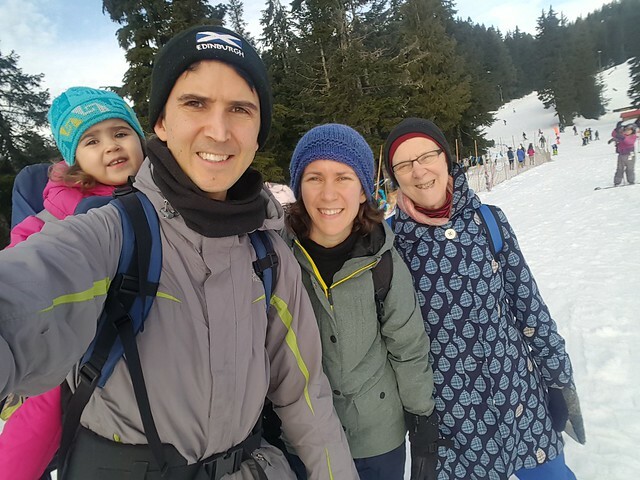 We spent the first Saturday snowshoeing up on Mount Seymour. Astrid had fun playing in the snow, making snowbabies, and sliding on her bum. We had to run back when Astrid announced she had to pee (the new reality of being diaper free) and I couldn’t convince her to just pee in the snow. I was impressed she was able to hold it in with me bouncing her up and down the whole way. Then she knocked a tooth out that night and it has been all downhill from there. She was drinking water from a bottle with a hard straw when she tripped. 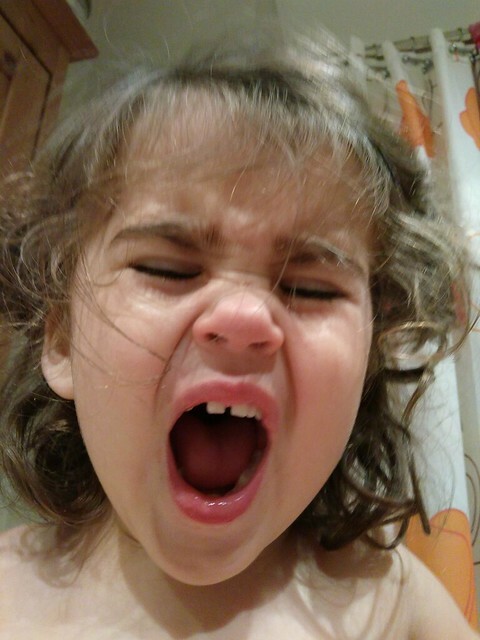 There was lots of blood and a few tears, and then she spit out a tooth. I was distraught but Astrid was back up running around like nothing had happened within no time. I kept worrying about the implications of losing a tooth that early (compounding all my personal anxieties about teeth). 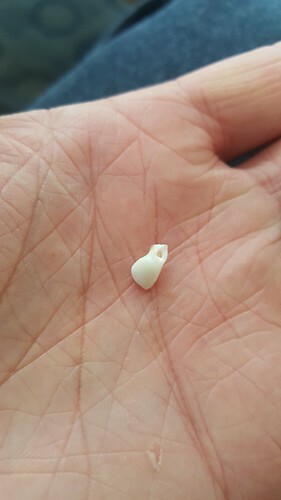 Yes, it’s just a baby tooth, but one that isn’t supposed to fall out for another 5 years! 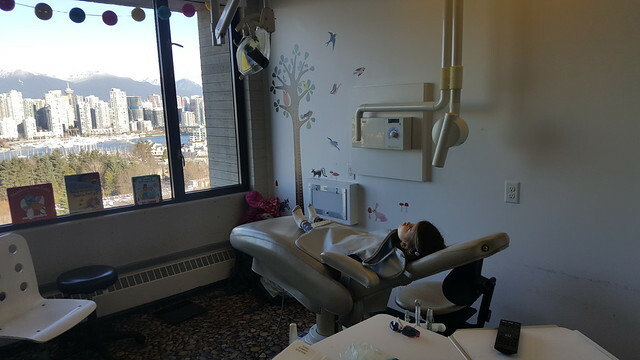 We saw a pediatric dentist a few days later and he assured us that it would be ok – no speech impediments or tooth spacing issues, but there was a piece of the root left that needs to be extracted – Astrid’s first dental surgery. The dental extraction hasn’t happened yet because Astrid has been dealing with colds and asthma. We ended up in the hospital with one of the worst asthma attacks Astrid has had in a while. It hit really fast before she had any cold symptoms and we couldn’t keep it under control at home. Normally they give Astrid a big dose of dexamethasone at the hospital to reduce inflammation, but this time they gave us a half dose of dex and a 3 day prescription for prednisone to give her more time to recover. But the prednisone came in bitter pills that we couldn’t get Astrid to take no matter how we disguised them (crushing it in yogurt, frosted sugar, chocolate pudding, ice cream). 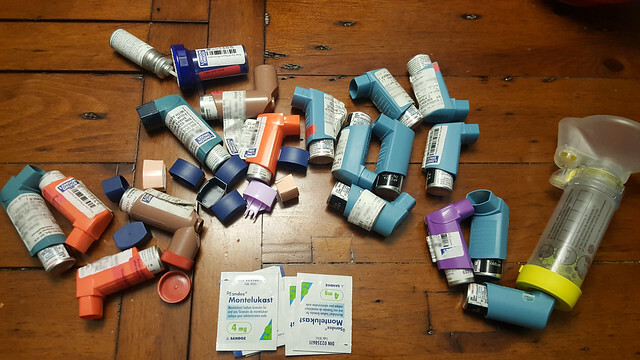 After some desperate conversations with pharmacists at 3 different pharmacies, we managed to get ahold of an emergency doctor at BCCH who switched our prescription to prednisolone – same drug but in less bitter liquid form. It was still a bit gross on its own, but she guzzled it down when we masked it with a strong ginger beer, which she luckily loves drinking. The next few days were not fun and we almost went back to the hospital on a few occasions but after sleepless nights for everyone and lots of drugs we got through that virus, although I ended up getting sick at the end of it and still haven’t fully recovered. 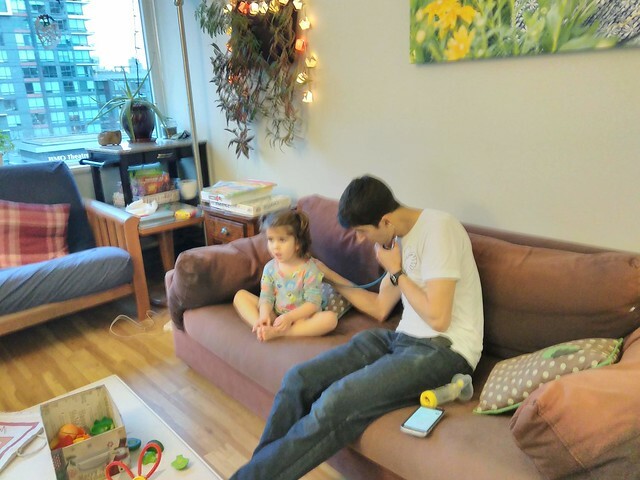 Astrid was mostly healthy for a few days before she picked up a new bug that lead to nasty cough and 4 days of periodic fevers, which were usually mild but one day she was feverish for over 12 hours and her temperature hit 39.9 C before we gave her ibuprofen. Luckily this latest virus hasn’t caused any serious asthma problems, which might mean her newest medication, Advair, is working better than the Flovent she was on before, although it’s probably too soon to tell. Emily has managed to escape all of this mostly unscathed. Astrid is almost back to full health and we’ve rescheduled the dentist for 10 days from now if she can stay healthy. I’ve gotten really good at pretending to be Doctor Daddy. 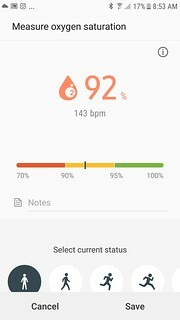 I can now calculate Astrid’s asthma PRAM score on my own using the stethoscope we have and the oximetry sensor on my Samsung phone that measures oxygen saturation. If I can’t keep the PRAM score below 4 then it’s time to go to the hospital. 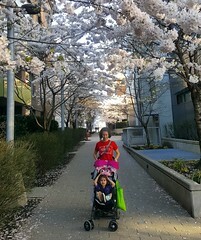 All of our health concerns have us contemplating more drastic lifestyle changes – like pulling Astrid out of daycare, getting a nanny, spending our winters in Mexico, or going full hermit in rural Manitoba with my parents. If I was more confident that any of them would prevent Astrid’s asthma attacks, I would do it now. On the positive side, Astrid is now sleeping in a bed and is almost fully potty-trained. She still wears a pull-up at night, but wakes up dry most mornings. Moving out of the crib and into a bed was a bit of a transition. 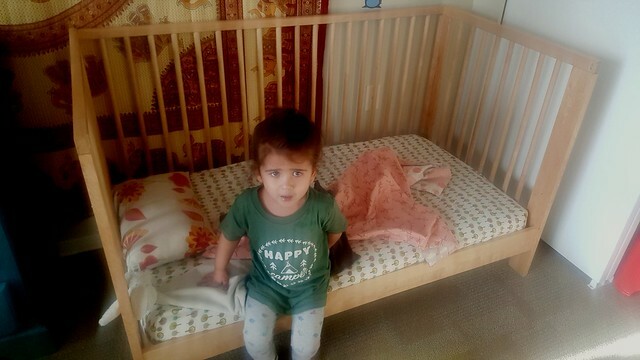 The first week worked miraculously well, but then she got sick and was waking up more at night and discovered she could just walk into our room whenever she woke up. But we bought a Gro Clock and she’s doing better about staying in bed until the “sun comes out”. Bedtimes are still a bit of a struggle. When she got sick, one of us would often sleep next to her bed for comfort and now she wants that every night. Emily tried to go back to the ‘put down and walk out’ system when Astrid was healthy again, but that just lead to an epic sleep battle one night. Emily would put Astrid down to sleep and leave the room, and Astrid would lie down for 10 seconds before getting up to find her. They did this for 90 minutes! 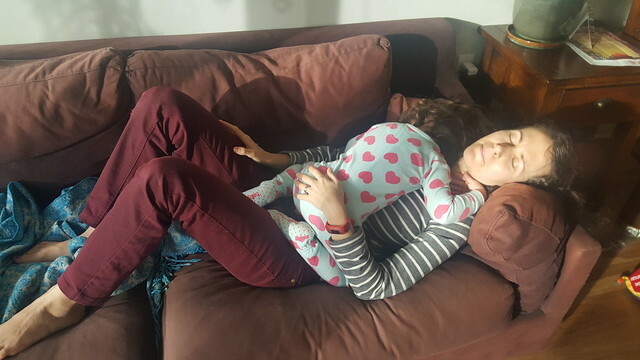 I eventually had to intervene and find a compromise where I sat in her room (but out of sight) until she fell asleep. That’s been our new normal for the past 2 weeks. We’ll have to slowly transition back to where we were before. Astrid’s imagination has really blossomed in the past month. 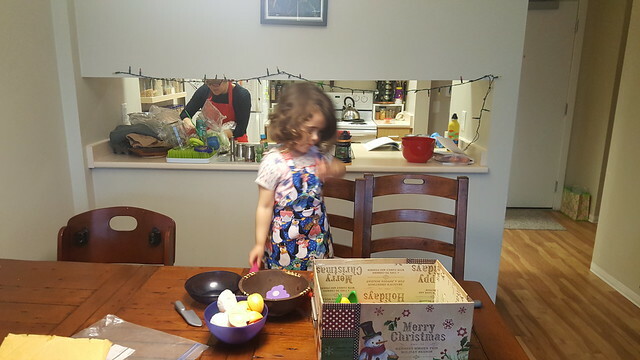 She likes to play make believe and pretend she’s cooking or shopping. She makes up new words to songs. 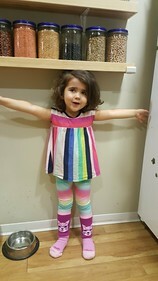 She changes the diapers of her dolls and pretends to flush their poopies down the toilet. Yesterday she invented a bear family that had joined us for dinner and was shooing them away so they wouldn’t eat her pizza. It’s awesome.